If you missed a previous newsletter or want to go back and refresh your memory about someone go to our Texas Politics Today website where we have the newsletter archived by date. Editor’s Note: Please be sure to send us news of departures, promotions, births, marriages and other milestones, so we can share it with the Capitol community. Also add us to your press release email list. Hope Osborn has joined Sen. Kel Seliger’s office as Communications Director and Policy Analyst. She is coming from her previous role as Legislative Director for Rep. Morgan Meyer. Sen.- elect Beverly Powell has named Garry Jones as her Chief of Staff. Jones was Powell’s campaign manager. Rick Svatora, legislative director for Sen. Borris Miles, will be Powell’s Deputy Chief of Staff. Jordan Long will be Rep.-Elect Jared Patterson’s new Chief of Staff after previously serving as Legislative Director for Rep. Matt Rinaldi. Andrew Blifford will serve at the new Finance Director. Blifford is a long time staffer for outgoing Speaker Joe Straus. Gene Acuna has been named Communications Director. Acuna previously worked as TEA Communications Director and Director of Advocacy and Communications for EducateTexas. Mark Bell, former aide to Speaker Pete Laney, has been named deputy chief of staff. Bonnen has named Sharon Carter and Hugh Brady to serve jointly as the 86th Legislature’s House Parliamentarians. Reggie Smith was sworn in recently to finish the unexpired term of former Rep. Larry Phillips. Smith also won the full term in the November election. James Talarico was also sworn in recently to finish the unexpired term of former Rep. Larry Gonzales. He, too, won the full term to replace Gonzales. Amanda Foster has been hired as the new chief of staff for Rep-Elect Julie Johnson. She worked as the Legislative Director for Rep. Gina Hinojosa previously. Santiago Diaz, who previously worked for Sen. Mario Gallegos, is Sen. Borris Miles‘ new legislative director. RG Ratfcliffe, veteran Capitol reporter who most recently has written for Texas Monthly,is retiring from state capitol coverage and will now freelance for Texas Monthly as well as assist TM reporter Carlos Sanchez with legislative coverage. Outgoing Rep. Jason Villalba has indicated he’s seriously considering running for Mayor of Dallas. US Rep-Elect Chip Roy has named Nathan McDaniel, most recently his campaign manager and a former Capitol staffer, as his district director. Rep. Mayes Middleton has joined the House Freedom Caucus, while Rep. Jeff Leach has decided to leave the Freedom Caucus. Sen.-elect Nathan Johnson has named Deisy Jaimes as his Chief of Staff. Jaimes has been the ED for the Senate Democratic Caucus. Rep. Justin Holland has been named Vice Chair of the House Republican Caucus. Former Rep. Jason Issac has left the Texas Conservative Coalition Research Institute to pursue other opportunities. Mia McCord,currently Vice-President, will serve as interim president. Andrea Stingley, long time Chief of Staff for Rep. John Smithee, is leaving that position and is joining Blackridge, an Austin lobby firm. Brian Jammer, who worked for the UT System for over 15 years, is replacing Tom Kleinworth as the VP for Government Relations at Baylor College of Medicine. Steve Holzheauser has joined Cornerstone Public Affairs. He previously worked for Woodhouse Group Texas. Morgan Canfield Taylor has joined Crosswind Media & PR; she comes from Governor Greg Abbott’s digital campaign team. Carolyn Scott, most recently with Speaker Joe Straus‘ office will be joining Mignon McGarry’s lobby shop in January. Russ Keene is the new Executive Director of the Texas Public Power Association. He previously was a partner at Crossnore Group, LLC. Don Forse, currently Director of Government Relations and Policy at the Land Office is leaving that position this month. Forse had been at Capitol staffer working for former Sen. Bob Deuell before leaving for the GLO. He’s headed to the private sector. Bogan Pollock is starting a new position as Director of Public Policy for the University of Texas at Arlington. She previously worked for Gov. Greg Abbott as as a budget and policy advisor. Ted Hughes retired from his position as Veterans’ Program Coordinator at HHSC, at the end of November. Attorney General Ken Paxton has promoted Amanda Cochran McCall to division chief of general litigation, and Darren McCarty as the new deputy attorney general for civil litigation. Congratulations to Michael Ramsey and Kyler Arnold who were married on December 1st. Lobbyist Parker McCollough recently appeared on an episode of HGTV’s Bahama Life! Congratulations to Amy DeWeese and Glenn Deshields on their recent wedding. Rep. Mary Gonzalez has been named Vice-Chair of the Board of Hispanic Caucus Chairs, a national group of Hispanic legislators in leadership positions. AG Ken Paxton has been named Chair of the Republican Attorneys General Association. Former Rep. Reby Cary of Fort Worth passed away recently. He was Ft. Worth’s first black school board member and came to the Legislature in 1979. Ryan Wallace, former policy analyst for Sen. Charles Perry passed away recently. Ashlee Quick, assistant to Bonnie Bruce of the Texas Society of Anesthesiologists, has assembled freshman congressional and legislative flash cards! Tinycards are flashcards by Duolingo, which is a free online app for learning languages. But they have expanded beyond language flashcards to include all kinds of subjects including……New Texas House members. Go here to start learning what our new legislators look like. 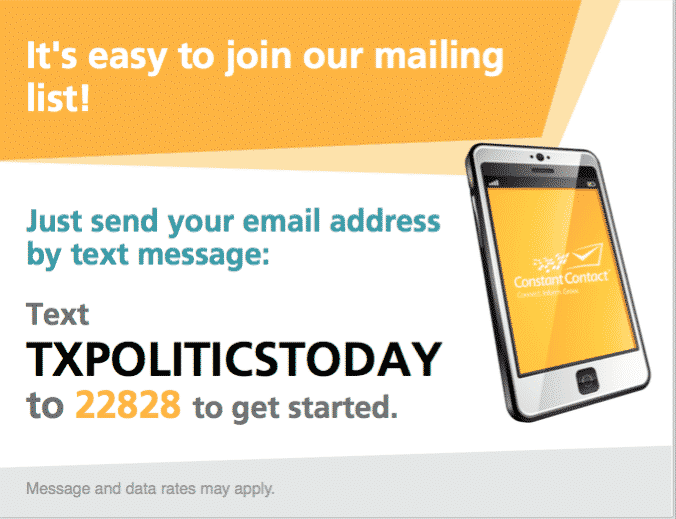 Contact us at txpoliticstoday@gmail.com or text us at 512-431-5385 to let us know of other moves, birthdays, lobby sign ups, birth announcements, events, and happenings that you and your Capitol colleagues would like to read about.